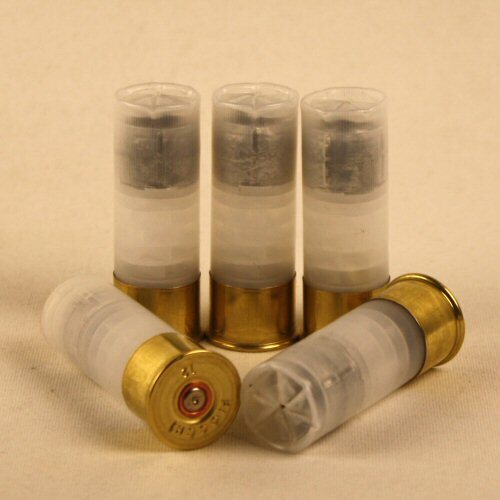 The shotgun shell is to fit 12 bore, and is loaded with a 1oz slug. The shell case is a new Fiocchi case in white translucent to show the wad and slug within. The primer is a deactived, dented primer with no ignitable material within. The simulated powder is also inert and not ignitable. The top of the case is star crimped and the overall length of the cartridge is 60mm. The shotgun cartridge is true to weight for safer practice loading, especially at speed. The inert shell is a safe way of displaying deactivated arms and ammunition side by side, whether for collections, displays or film and TV use. Price is for ONE shell only. NB: All inert ammunition travelling OUTSIDE mainland UK must be shipped by international courier (eg TNT, DHL).